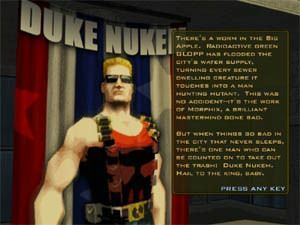 Duke Nukem Manhattan Project is based on the classic arcade platformer game that was released by Apogee Software in the glorious days of Shareware. Eventually it was turned into a first person shooter by 3D Realms and then suffered from a cult following. Duke Nukem is back....no, not the new first person shooter but a brand new 3D arcade style platformer that pays homage to the original. 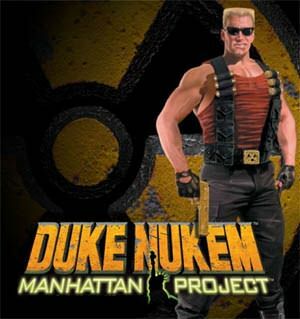 Duke Nukem Manhattan Project brings Duke back in the fray when mutated monsters have gone on rampage in New York City. Only one man is suitable for this job and that man is Duke Nukem. 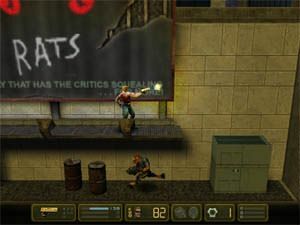 Based in New York, Duke travels through various game environments that include the streets of Chinatown, the deadly and awfully smelly sewers of New York to the vertigo inspired roof tops of New York skyscrapers. 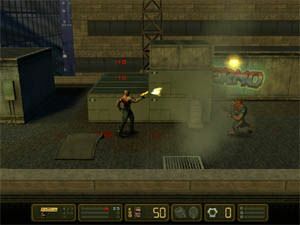 The gameplay of Duke Nukem is quite simple, you must collect various weapons in order to destroy these mutated monsters and save New York. Whether it's a gun, shotgun or machine gun, there's something for everyone. Along the way, you must also rescue beautiful table-top dancers, solve puzzles and have a damn good time. Although Duke Nukem Manhattan Project is based on the old arcade 2D platform style games, this new addition to the Duke Nukem saga utilizes the power modern day PC gaming that makes this one of the best arcade experiences to hit the PC in a long time. The game contains 8 huge levels of varied gaming environments, whether it's the traditional 2D platformer view or the new and improved 3D view. For instance, when you are creeping along a building ledge, the camera will swing to a closer view to give you a sense of height. Another bonus of this new engine is that it has been extremely well programmed because everything looks nice and the framerate is silky smooth. Graphically, Duke Nukem is full of detail and contains some awesome looking special effects that really increases your gaming experience. Some of the ingame special effects include awesome lighting effects, realistic explosions and some highly detailed polygon characters. For instance, when you rescue one of the dancers, the game will actually change its view and zoom in on her so she can show Duke her...assets. 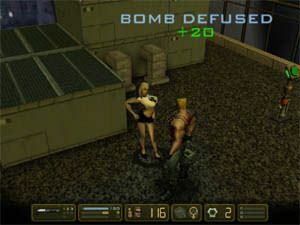 Combat is Duke Nukem Manhattan Project is simple, it's basically a point and shoot game. By pushing the fire button faster, your weapons will shoot faster. You must navigate Duke by making him run, jump, hang and climb various objects in the game. Duke Nukem also supports a wide range of different controllers that include force feedback. There are various enemies that you will encounter in the game, some familiar from previous Duke Nukem games and some new faces, including bosses. The only thing that Duke Nukem Manhattan Project lacks is decent music. With the popularity of Duke Nukem, you would of thought some awesome heavy metal music would have fitted in nicely with this game, alas that didn't happen. Fortunately, Duke Nukem makes up for the lack of music by his cool one-liners and his take no #@$ attitude. The sound effects of Duke Nukem Manhattan Project, although nothing extraordinary suit the game very well, whether it's the sound of a machine gun or the gurgling noises of the enemy. In conclusion, Duke Nukem Manhattan Project is a great little arcade game that pays homage to it's predecessor. Although the storyline is not too gripping, this game is ideal when you want to kill between 10 - 60 minutes on a game that is not too involving. I would recommend this game to anyone who enjoys the Duke Nukem series, those that love a good 3D platformer or for those wanting something different in a world where most PC games are either first person shooters or strategy games. Make sure you check this out, this game delivers and what better way to get your Duke Nukem fix before the first person shooter comes out. Recommended!